PUT A STAR ON THAT SPECIAL CAR! Put a Star on that Special Car! Now there is an easy & effective way to highlight your vehicles' windshields . 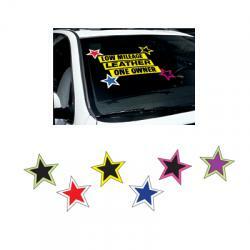 Use these 5 inch tip to tip stars to draw attention to your windshield messages, model year or price. Available in six color combinations. Use with E-Z Lettering's wide variety of numbers & slogans. Quantity discount price available on 26 dozen or more.